I had a wonderful time in Kiev in March. I arrived on my birthday to a decorated apartment (thanks Serge and Lera) and a wonderful meal with Kostya and Olga Farkovets and family. The Young Adults met at our apartment on Sunday and Wednesday evenings for times of fellowship, study, and sharing meals together. The Teens met on Friday evenings. 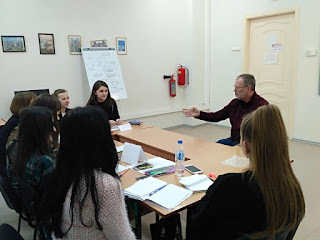 With these groups I studied the stories of Jesus raising people from the dead, the meaning of Jesus’ death, and how the resurrection is part of God’s plan to redeem and restore creation to God’s original intent for his world. 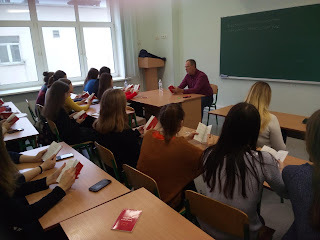 At Borys Grinchenko Kiev University I taught thirty-three classes. I gave away 150 copies of “40 Days with Jesus” a booklet about preparing for Easter and walking with Jesus through the Lenten season. I also distributed New Testaments to one group of students (because I was out of the other booklet). The students are very diverse at the university, some are engaged Christians while others had never even heard the story of Adam and Eve in the garden! 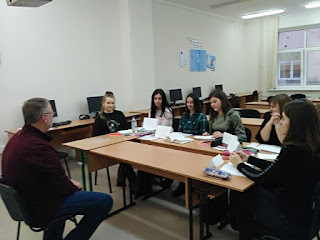 With one group of students we celebrated an “Easter Party” at their request (this is the same group that had the Christmas Party – I think we have started a tradition!). Several students posted on Instagram about our classes. It is an amazing experience to be able to interact with these students and teach them about Jesus and the life of faith. 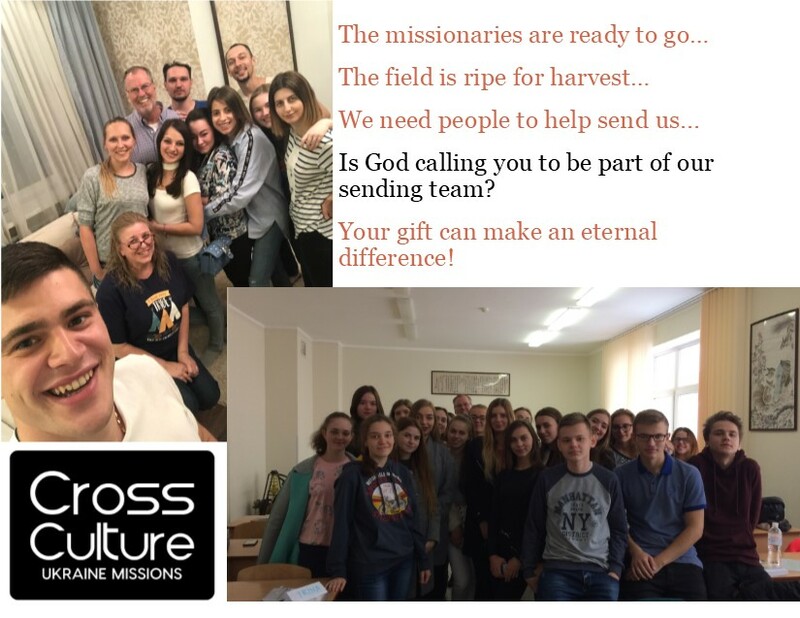 Thanks to our ministry partners who make it possible for me to work in Kiev, sowing seeds, encouraging faith, and helping disciples grow in the image of Jesus. 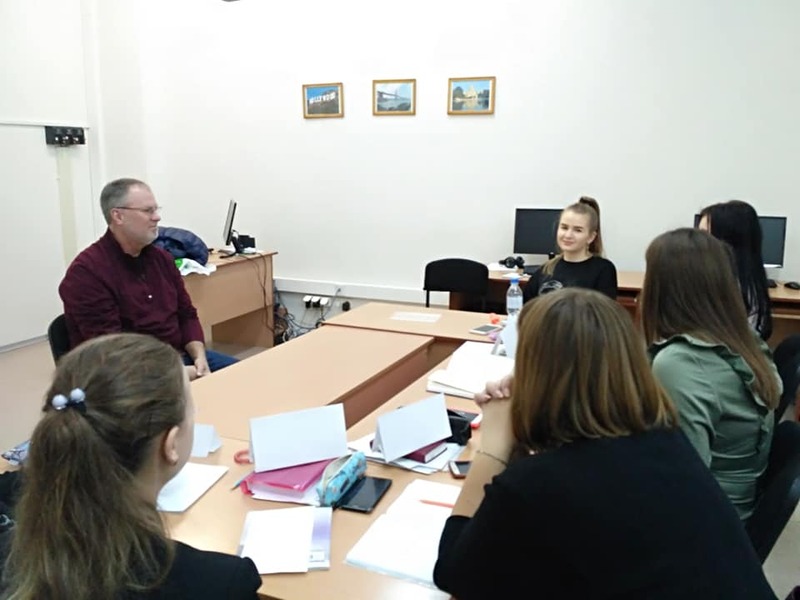 Kenny Payne will be in Kiev, Ukraine from March 4-27, 2019. Small groups will meet for Young Adults on Sunday nights at 6 PM and Wednesday nights at 7 PM. Teens will meet on Friday nights. 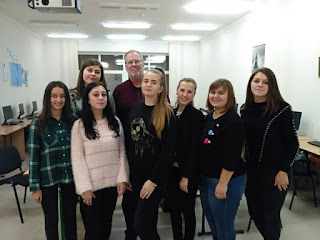 In addition Kenny will be visiting classes at Borys Grinchenko Kiev University each week. Please pray for safe travels and for great discussions and spiritual growth! Thanks! The Payne family is making plans to return to Kiev, Ukraine in March 2019. 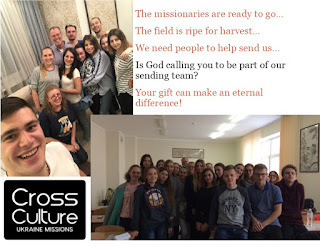 We are still short of our needed funding for 2019 and we invite you to partner with us in sending us to work with the Young Adults, Teens, and College Students who are interested in maturing in Christ or in learning to follow Him. Follow the Donate link above to give! Thanks. After being in the US for a couple of months to help with Hurricane Michael clean up in Panama City (Please keep the people of Panama City in your prayers as they experience major devastation that will take a long time to recover from) and packing up the house to place our stuff in storage, I (Kenny) traveled to Kiev on December 4 for about 17 days. I have been teaching a lot of classes at Grinchenko University, meeting with our Young Adult and Teen small groups. We purchased a case of "The Message of Christmas" books to use at KUBG and the kids love them! Thanks to all our donors who make it possible to work with these young people! Lora and I were granted our Temporary Resident Permits allowing for full year residency. There was a technical problem with Lexi’s, so please be praying that everything gets resolved and she is granted one as well. Our Discipleship Small Groups are meeting each week. The teens meet on Friday night and the Young Adults meet on Sunday evening. We are reading through the Sermon on the Mount with the teens and the Gospel of Luke with the young adults. The discussions are engaging, and you can see growth happening from week to week. 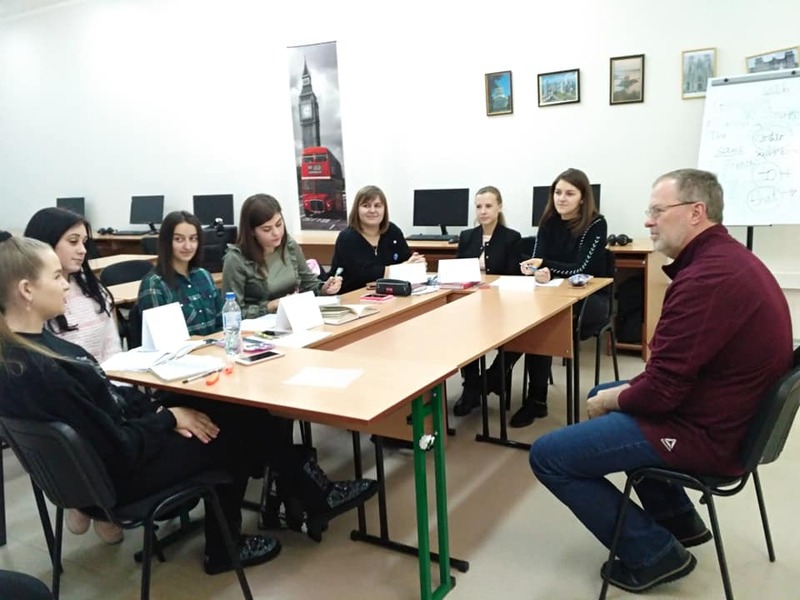 I am visiting English classes at Grinchenko University each week and teaching things like “Building Strong Character,” “Relationships,” and “What is love?” I am amazed at the language ability of the freshmen classes I have visited, so much better than 20 years ago! Lora has been busy creating “teaching artwork” for the apartment. She made a chalkboard where the memory verse for the week gets displayed, as well as other signs (see attached pictures). We also send Facebook posts a couple of times a week to remind everyone of the story we studied on Sunday. We are trying to keep the word of God in front of our student’s eyes in a variety of ways. 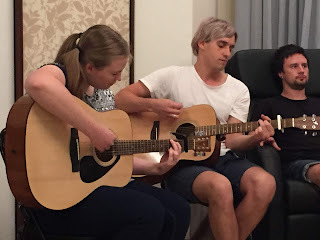 School started for Lexi in September and she is busy with classes, guitar lessons, and small group activities. I am taking online classes through Loyola University Chicago, working towards a Graduate Certificate in Spiritual Direction. Last week we took our young adult small group to a Bethel Music concert with Jeremy Riddle. Yesterday I attended a lecture and a meet and greet with Phillip Yancey. We are enjoying living in the big city! Thanks for being such faithful ministry partners! Your gifts are changing lives! Kenny, Lora and Lexi Payne live in both Kiev, Ukraine and Franklin, Tennessee. When going back is unfaithful….